A new, nonpartisan movement has begun from Beach to Bay Central Council (BBCC), that seeks a full-service hospital for Long Beach. Right now, all emergencies are being transported out of town, adding 20-30 minutes to arrive at the nearest hospital. This adds a huge risk to all of us in emergencies where seconds count, and strains our first responders who are stretched thin and cannot return for the next emergency for up to several hours. Speaking to me for them is BBCC member and Lido Homes Civic Association President Darlene Haut. “Who buys the assets is not our concern as long as they reopen a hospital. We don’t want it sold to real estate developers. We don’t want it sold to another hospital entity that will just open an urgent care (doc in box) in Long Beach and not give us a hospital with an Emergency Room. If they only give us an Emergency Room (without a hospital), its doomed to fail financially and we risk losing it… we need an ER Hospital” she said. I feel this is a movement I can get behind because it represents the interests of our lives as residents here on the barrier beach to the only things that count to everyone here- access to quality care, here, and use of public funds for the public benefit. BBCC are a civic association (residents representing residents) with all members from the area, representing the public interest. 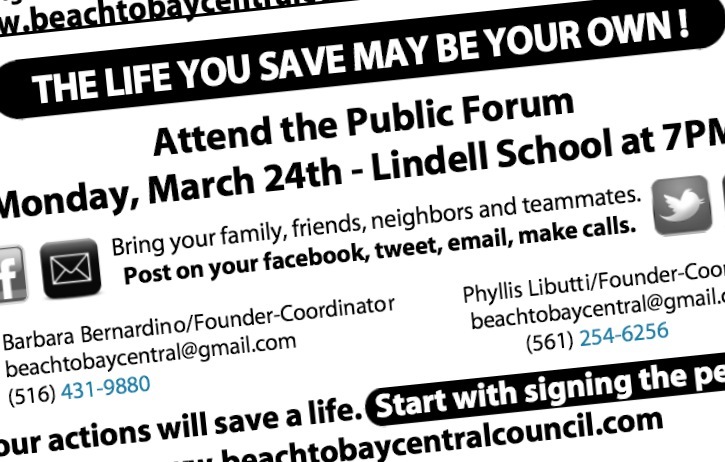 The group want to “get the word out, educate, get signatures on the petition, and coordinate the public forum on March 24th at Lindell. 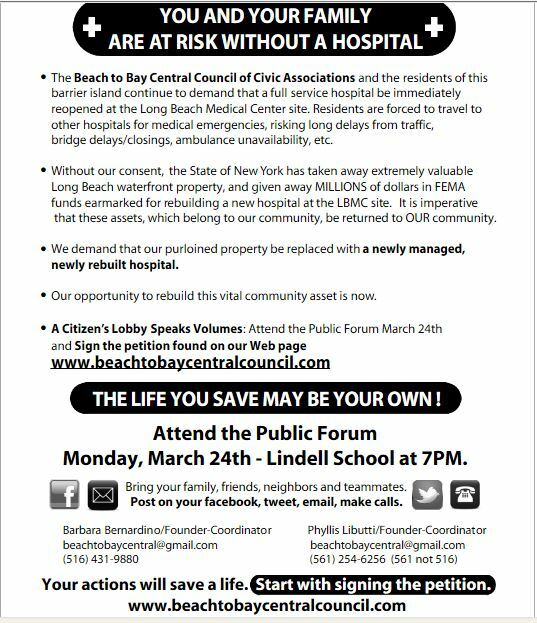 “We are trying to get everyone on the same page so our politicians can hear a loud voice from this barrier island and ultimately (reopen) an ER Hospital in Long Beach.” Ms Haut said. This entry was posted in Event, get involved!, news, people, places, politics and tagged Beach To Bay Central Council, Emergency Room, Hospital, long beach barrier island, Long Beach Medical Center. Bookmark the permalink.